Here is a thought provoking editorial from The New York Times. Marielle Anzelone, an urban conservationist biologist, argues that the urban agricultural movement has gone too far by promoting edible at the expense of non-edible flora. Without the diversification that comes with planting native non-edibles, insects, which are critical to the wellbeing of our ecosystem, are in danger of loss of habitat and food. She makes a good argument. What is your opinion on the subject? ROOFTOP vegetable gardens were one thing, but the urban agricultural movement has gone a step too far. A new brand of activists want to incorporate fruit trees into the fabric of city life by turning our limited green space into woody groves filled with apples, cherries and plums. One group, the Guerrilla Grafters, has gone so far as to graft the branches of fruit trees onto street-side ornamental trees in San Francisco. At first blush these campaigns appear well intentioned. The groups are planting trees in underserved neighborhoods to provide access to healthy foods. What could be wrong with that? Don’t misunderstand me, I like fruit as much as the next person. It’s not the orchards themselves that irk me — it’s the shortsightedness they represent. By so narrowly defining useful landscapes, the craze to farmify our surroundings has made it all about humans. There’s nothing wrong with a utilitarian view of nature. The problem is that we are ignoring the utility of plants like wildflowers and native ornamentals in favor of imported fruit trees. All around us, even in cities, there are natural processes at work that we depend on. Although largely overlooked, these “ecosystem services” are critical to the survival of our species. The results help fill our produce aisles. One study placed the monetary value of pollinating the world’s main food crops at over $200 billion in 2005. Though we pay these insects not a penny, we are deeply in their debt. A farm-filled landscape would undermine this critical ecological process. Bumblebees rely on wildflowers for a steady supply of pollen and nectar. But fruit trees bloom for only a few weeks a year. When forests and meadows are lost (to development or farming), places for bees to eat also disappear. These wild bees feed us, but we are not feeding them. Yet landscapes designed solely to put food into our mouths result in the further loss of winged wildlife. A better way to reimagine our public spaces is through the multifaceted eyes of insects, the original locavores. The foodies among us will note that sassafras, a local woodland tree, is the source of root beer. But its true gift to us is the gorgeous spicebush swallowtail. The caterpillars of this native butterfly are picky eaters. They feed on the leaves of sassafras, spicebush and closely related woody plants. This butterfly, which is also a pollinator, is not able to survive on cultivated plants like peaches and cherries. Most commercial fruit trees, and food crops for that matter, hail from other ports of call. 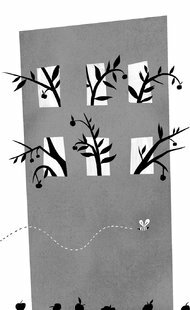 A monoculture of exotic imports offers little nourishment for our wild neighbors. But plants that have been here for thousands of years are in constant communication with insects. A chemical cue here, a flash of color there, so goes the ecological dance in which native pollinators and other insects participate. A study published early this year in the Proceedings of the National Academy of Sciences found that bumblebees preferred to forage at sites with a greater variety of plants and more floral choices. They would like our landscapes to look more like diverse natural meadows than single-species farm fields. Such considerations are paramount in cities, where open space is in short supply. Urban activists should celebrate the indigenous wildflowers that sustain our pollinators beyond the short life span of fruit tree blossoms. In addition, we should incorporate native edibles into the planting palette. Blueberries, Juneberries and beach plums feed more species than just us humans. Here is what you will not see in a vista full of fruit trees: a surge of migrating monarchs, a dizzying constellation of wild bees, the swoop of songbirds that feed on them. These natural phenomena still occur in cities, but have been marginalized. They should be reclaimed and put center stage in our public spaces. To do this, we need urban oases filled with native plants. With all we are continually discovering about the world around us, let’s not limit ourselves to supporting only what directly fills our stomachs. A rich natural environment also provides what is on our plates, while nurturing our heads and our hearts, too. Mariellé Anzelone, an urban conservation biologist, is the executive director of NYC Wildflower Week. In her piece on the urban fruit growers, Ms. Anzelone has given us something to think about; her argument that humans are focused on their own food preferences to the detriment of the dietary needs of nature’s pollinators is an example of the law of unintended consequences. I found this an interesting take on the usual feel-good eco-warrior story. Thanks for bringing it to our attention. You are welcome…it is an important topic. Thanks for sharing this; it is very thought-provoking. I find myself thinking that most Americans at some level believe in the Great Chain of Being, with humans at the top of the heap. But thinking the way Marielle Anzelone wants us to think requires seeing humans as part of an ecosystem, not just as privileged consumers of that ecosystem. The big breakthrough in understanding came for me when I read Doug Tallamy’s Bringing Nature Home, with his analysis of the vital place of insects in the food chain. That understanding made gardening a much more relaxing activity as I could now see most of the insects and “weeds” in my garden in terms of the contribution they make to the ecosystem we share.